Residents of areas in the south of Johannesburg including Eldorado Park, Freedom Park, Slovo Park, Lehae, and Soweto have embarked on a wide-scale service delivery protest to amplify the struggles of the poor and the workers. 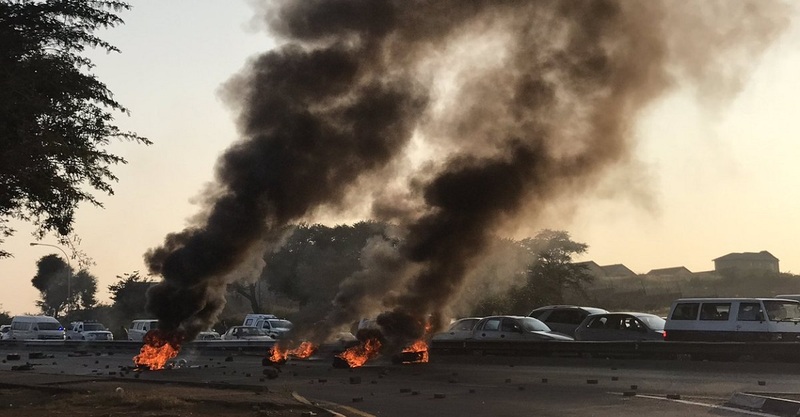 The protest began in parts of Soweto, Lenasia, Freedom Park, and Eldorado Park in the early parts of the morning on Wednesday, 2 May when Johannesburg South residents barricaded roads with burning tyres and rubble in an attempt to completely shut down the area. Protesting residents and metro police were also involved in altercations where the protesters pelted officers with stones and officers shot at them with rubber bullets. The Soweto Action Committee (SAC) and the Gauteng Civic Associations (GCA) organised the protests. â€œThe community is very angry,â€ chairperson of the GCA, Thami Hukue, said to The Daily Vox. He said last year the community was in the same position protesting for housing, land, and jobs. After a rally in November, the provincial government promised residents 48 000 stands of land under Paul Mashatile who was the Gauteng MEC for human settlements at the time. Mashatile has since adopted the position of Treasurer General. â€œThere was a commitment from local, provincial, and national government to respond to the demands that were made,â€ Hukue said. However, the community has not received clear communication about timelines and implementation since. Hukue said communities feel that the government is neglecting to provide adequate service delivery and listening to the concerns of the residents in Johannesburg South. Some of the other concerns include the increments of Eskomâ€™s prepaid system; the fight for decent housing and land; jobs with decent salaries; and the VAT increase. â€œThe poor are supposed to pay for the rich to get richer through prepaid basic service delivery. The poor are supposed to be landless and to live in shacks and RDPs when ministers and those in high places own mansions, mines, and land where they build mansions whilst the poor remain in shacks and in hostels. They go on to earn high salaries and the poor workers [are] forced to take the lowest of the minimum wage,â€ the SAC and GCA statement read. One resident told SABC News that residents are fed up with empty promises and not being listened to. The Johannesburg South residents also gathered in Johannesburg South on 27 April for the Un-Freedom Day rally in the hope of expediting the process of allocating more than 48 000 stands promised to them and to reflect on their daily struggle to gain access to land. They are expected to rally again at the Eldorado Park Stadium on 12 May to further express their concerns. The Daily Vox has reached out to the Gauteng human settlements MEC and to Eskom, this story will be updated when it is received. Give the people, what they need for what they want they’ll fend for themselves. Giv us the land as promised. A obuye umhlaba.